We have heard a lot of questions and a lot of anguish lately about facility fees, which are charged by hospitals and other institutions for the use of their, well, facilities. Here’s a roundup of what we know about this topic. Hospitals often charge a facility fee on top of a doctor’s fee or a fee for performing a service. Federal law allows hospitals to charge facility fees for outpatient services at affiliated clinics, even if they’re not near a hospital. The clinics may look just like a private practice, but the fact that they’re affiliated with a hospital means they can charge that extra fee. We have heard of people who went to the same clinic for a visit a year apart, and the second visit incurred a facility fee because the clinic had been acquired by a hospital. 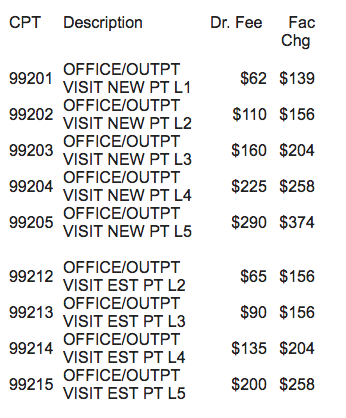 How will I know that I am being charged a facility fee? You might be billed for the same procedure and the same medical billing code twice on the same day. Sometimes it’s marked as a facility fee; sometimes it’s not. Often the insurance company (if applicable) will apply a big writedown to a facility fee. You should always look carefully at your bills to understand exactly what you’re being charged, and exactly what you’re paying for. A woman in New Orleans named Nancy DuBois had a sore shoulder. She went to a sports medicine clinic and got a diagnosis of “frozen shoulder.” She paid a doctor bill, and a co-pay, but later also received a bill of $1,434.01 for a “facility fee.” She was responsible for $137. 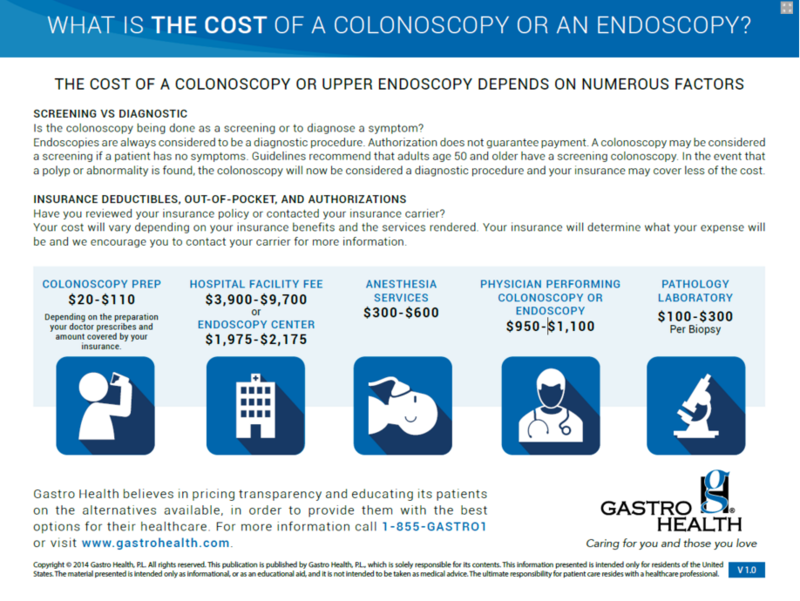 When I had my colonoscopy, the total for doctor, anesthesia and pathology was around $2,700. I paid $30 four times: for doctor, anesthesia, pathology and a visit for a prep briefing. In my case, there was no facility fee; the procedure took place in a doctor’s office. My girlfriend’s took place at a GI center, not her doctor’s office, and the biggest line item on the bill was $2,700, for the facility fee, of which the insurer paid a bit less than half. She was not asked to pay the balance. Do I have to pay? Can I just refuse? Or appeal? We don’t make recommendations about not paying. We do have a “how to argue a bill” post. Why is this happening? I mean, didn’t I pay the doctor and the lab fees? So what is this extra big chunk of money? The facility fee increases cash flow for the hospital. It makes them more money. It also serves as an incentive for hospitals to buy smaller practices. Read more here. Some insurers will refuse to pay a facility fee from an in-network provider. Some insurers will pay only a part of the facility fee, and depending on your insurance plan or your state’s policies on balance billing, you might be responsible for some or all of that fee. So it pays to ask up front, “Is there a facility fee? How much is that? Is it covered by my insurance? Does there have to be a facility fee?” When we survey providers to collect prices, we learned that some places would quote us only a facility fee, adding that the doctor fees varied by provider, and so did the anesthesiology fees. Most places said labs were extra and unpredictable. We advise people to always ask prices in advance. Some people prefer not to use hospital-based providers, and seek to avoid facility fees that way. This can be tricky, though: as mentioned before, sometimes a clinic has been acquired by a hospital and begins to charge a facility fee. Here’s our handy list of questions to ask before a colonoscopy; it could be adapted to any procedure. First, make sure it’s a preventive (screening) colonoscopy. If it’s not preventive (screening) but rather a diagnostic colonoscopy — looking for a diagnosis for a symptom in your GI tract, then it can be charged as a “sick person” visit — just as a screening mammogram is covered under preventive care with A.C.A.-compliant plans, but a diagnostic one is not. What all is covered? Doctor’s fee, anesthesiologist, lab fees, office visit for preparation, anything else? Will there be a facility fee? Does there have to be, or can it be done at another place without a facility fee? What kind of anesthesia are you planning to use? How much will it cost? If there is a separate anesthesiologist, is that person part of my network (if you’re insured)? Will all lab tests be done at a participating lab? Do you require a pre-procedure consultation? How much will that cost? Is it mandatory? How about the stuff you have to take to empty your system before the procedure? How much is that going to cost? is it covered by insurance? Take notes, and take names and phone numbers. If you need to question a bill later, it’ll be much easier. How much are facility fees? They vary widely. This is a graphic from a non-hospital gastroenterology center suggesting the range of prices. Consider the source, though; the gastro center charge might be $0 as it was in my example. How do providers defend these fees? In our partnership in New Orleans, our partners Jed Lipinski at NOLA.com I The Times-Picayune and Lee Zurik at WVUE Fox 8 Live news added to our knowledge. “Services that take place within a hospital outpatient department are separated into two bills – one for the services of the physician and the other for all other costs. These non-physician charges reflect costs for all non-physician activity, including items such as equipment, utilities, maintenance, supplies and non-physician staff, such as nurses and other staff. When a physician provides a service in a hospital department, the physician bills a reduced service fee because the hospital, not the physician, is responsible for the “practice expense” associated with the visit, including all other non-physician support staff. In the course of our reporting, an insider at a New Orleans medical institution sent us a chart that was described as several years old, on the condition that we not name the insider or the institution, reflecting how the doctor’s fee and the facility fee relate to each other for a series of common office visits. We think this is out of date; the same institution had fees upward of $1,000 in examples we saw. Click on the chart to see the details. Tulane University Medical Center was cited in our partners’ reporting as the source of the hefty facility fee for a woman who went to a sports medicine clinic affiliated with Tulane. Tulane, of course, is owned by the HCA Healthcare chain, a giant U.S. for-profit group. How do non-hospital doctors feel about this? They’re annoyed, as you might imagine. Dr. Brobson Lutz,a private practice physician in New Orleans and former city health director under three successive mayors, runs a private practice from a New Orleans shotgun house in the shadows of Ochsner Baptist, one of the several hospitals in the Ochsner hospital chain. Here are some things he said to our Jed Lipinski in his interview. Why is it unfair to them? What do you think about Nancy Dubois receiving a facility fee for her visit? How did facility fees come about? This all seems like a bad idea. How do insiders feel about this when they’re not being quoted by name? We got this from an anonymous person who was responding to our facility fee reporting.